← What is a Buddhist priest? It’s a beautiful sunny winter morning here at Wabi’an, so I decided to sit out in the garden with a cup of fragrant soba-cha (buckwheat tea) and listen to the thousands of bees busily collecting nectar from the flowers in the grevillea bushes. They made me feel deliciously lazy! As I sat there listening to the bees, I enjoyed feeling the warmth of the tea heating up the cup and traveling into my fingers which were really cold from the brisk winter air. I took a moment to imbibe not just the warm smoky taste of the buckwheat tea, but its popcorn-like fragrance, as well as the visual pleasure of the green-brown glaze of the teacup through the clear straw-coloured tea. And, in this way, all my senses seemed to be absorbed in this moment of tea-ness which was ‘delicious’ on so many levels. 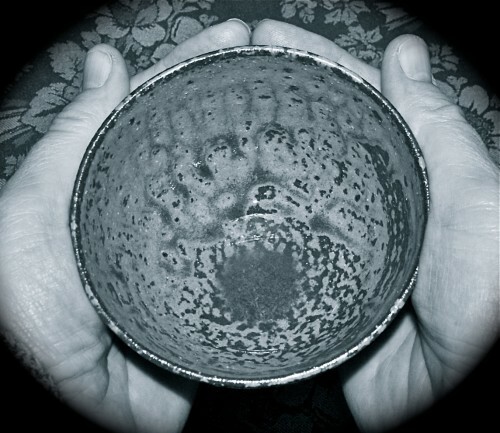 I also enjoyed the texture, shape and feel of the cup as I wrapped my hands around it. This cup is one of my favourites – it was made by a Japanese artist who lives in an artist’s community in a small village in the mountains near Koyasan, where I was ordained. The cup was a special gift from a fellow nun from my home temple, Muryoko’in, and although Buddhists are not supposed to be “attached” to the material world, I treasure this cup. Then, in my moment of tea-ness, I suddenly felt that my hands were holding this cup in exactly the way that the potter had intended when he made it, and I felt too that his own hands were held in just such a way when he fashioned the cup. At that moment, with the warmth of tea coming through the cup, I felt the warmth of the potter’s own hands as he had so carefully caressed and shaped this cup from its raw state that had come out of the earth. The unknown potter had gifted me this moment of profound awareness that engaged all my senses and connected me with his creative spirit and with the earth herself. I was deeply grateful to him and said a prayer of thanks for our connection. Do you have a favourite cup? What is its story? Next time you make yourself a cuppa, take a moment to feel the connection to the creator of the cup and, through that person’s hands, connect to the earth. I can assure you it is at the same time a very grounding as well as uplifting experience – and it’s right there for us to experience at any time of the day! I wrote the little introductory poem as a ‘haiku’ – a very brief form of traditional Japanese poetry in which the experience of a single moment is encapsulated in three brief lines. Try it! Soba-cha is a delicious tea made from roasted buckwheat – I don’t know if its available outside of Japan, but if you can find it it’s very healthy and tasty. I highly recommend a book called “The Unknown Craftsman: A Japanese Insight into Beauty” by Soetsu Yanagi, which explores the value and essence of art by craftsmen who remain unknown, and how “objects are born, not made”. Wonderful book! This entry was posted in Beauty, Poetry, Spirituality and tagged haiku, shojin ryori, tea. Bookmark the permalink. Dear Cate, your haiku is so evocative..I hope you are pleased with your creative effort..it zings through to the heart of the reader just as a successful haiku must! Reading your posting, I thought of the Buddhist saying, ‘if this is your favourite cup, treat it as if it were already broken.’ That philosophy upset me for years after I first encountered it. I have, however, meditated on it’s profound message and I am much better at accepting loss of all kinds now. I do have a lovely mug made for me in 1977 by a friend/potter. It’s quite large with a grey body and turquoise blue band at the top. The handle is perfect. When I need a large infusion of any liquid from soup to chai, Ann’s mug comes to my comfort and rescue. I hope that if/when it breaks or the handle falls off etc. I will be able to say, ‘thank you Ann’s creation for all the joy/beauty/service you’ve given me over the years.’ I loved this post, Cate. Thanks Deborah. Yes, it is difficult to deeply grasp the meaning of that Zen koan, but I think at its root it is saying to just enjoy the beautiful things that we have, just fully in that moment, without thought of ‘holding on’. But by all means enjoy it! I really like your comment about saying ‘thank you’ – gratitude is so important and really helps when we are faced with big losses in our lives as well.